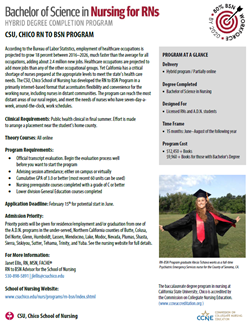 Are you a registered nurse interested in pursuing a baccalaureate degree in nursing? • Do you live in a rural area so commuting to campus is difficult? • Do you want to enhance your career as a health care professional and become a leader in your field? If you answered yes to any of the questions, you are a perfect candidate for the RN-BSN Program! The program is primarily one, allowing flexibility and convenience for the working nurse, including nurses in distant communities, who have seven-day-a-week, around-the-clock, work schedules. Applications for the fall 2019 cohort are due Friday, February 15. Learn more about the program and how to apply at rce.csuchico.edu/rn-bsn.